Armin Veh has paid the price for Wolfsburg's dismal run of form this season which has left them off the pace in the Bundesliga. 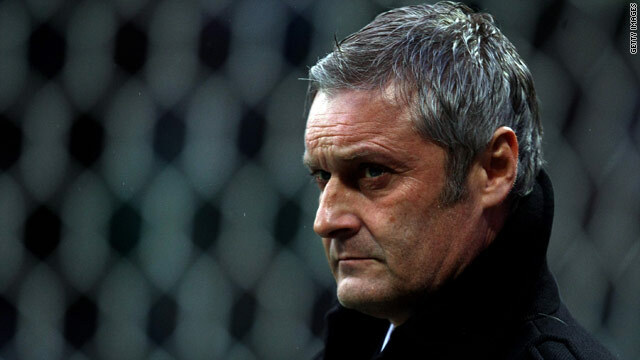 (CNN) -- German Bundesliga champions Wolfsburg have sacked coach Armin Veh with immediate effect after a disappointing season in defence of their title. Veh only took over in the summer but has paid the price for a run of nine matches without a victory. Wolfsburg slumped to their seventh defeat of the campaign, 3-2 against Cologne, on Sunday to leave them down in 10th place in the league table. The 48-year-old Veh took over last summer from current Schalke coach Felix Magath, who led the Wolves to their first-ever championship last season. Reserve team coach Lorenz-Guenther Koestner has been put in temporary charge until a new manager is appointed. A club statement said: "This decision is not easy for us on the board. However, we came to the realization that, after the many negative experiences of the past few weeks, we had to act." General manager Dieter Hoeness added: "We were no longer of the opinion that we could have changed the situation in the foreseeable future with Armin Veh."